Ceph is an open source storage platform, it provides high performance, reliability, and scalability. It's a free distributed storage system that can be setup without a single point of failure. Ceph provides an interface for object, block, and file-level storage. This is the second part of our Ceph tutorial series - click here for the Ceph I tutorial (setup a Ceph Cluster on CentOS). In the second part, I will guide you step-by-step to install and configure a Ceph Block Device client to use Ceph as a filesystem on CentOS 7. In this section, we will configure our CentOS 7 server as a Ceph client. We will configure the Ceph client as other Ceph node (mon-osd). Login to the eCph client node. Add a new 'cephuser' and set a new password for the user. Enable password-less sudo for 'cephuser' by adding a new config to the 'sudoers.d' directory. After enabling sudo password-less for the cephuser, we need to disable SELinux on the client node. Next, install NTP and sync the system time with the ntpdate command. Then start the NTP service. Add the host configuration for all ceph-cluster nodes to the '/etc/hosts' file. This is my configuration from Ceph I tutorial. In the first step, we've prepared the Ceph client node for the ceph installation. But we still need to configure the ceph-admin node to be able to manage the Ceph installation on the client node. We will install Ceph on the client node from the 'ceph-admin' node now. Login to the ceph-admin node. Edit the ssh configuration file with vim. Add the new client node configuration at the end of the file. Save the config file and exit vim. Next, edit the /etc/hosts file on the ceph-admin node. And add the client hostname and IP address. Save /etc/hosts and exit the editor. 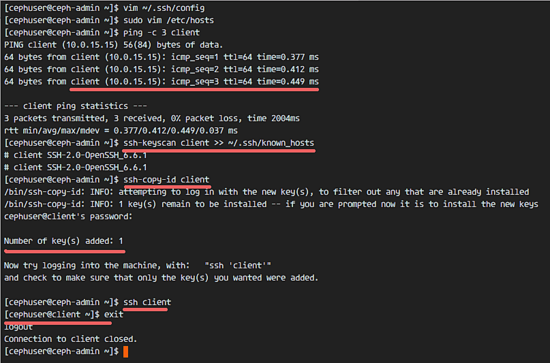 Now we can add the ceph-admin SSH key to the client node. Type in your "cephuser" password when requested. Try to connect to the client node server with the command below to test the connection. In this step, we will install Ceph on the client node (the node that acts as client node) from the ceph-admin node. 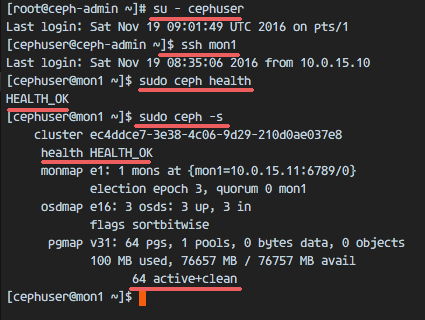 Login to the ceph-admin node as root by ssh and become "cephuser" with su. Go to the Ceph cluster directory, in our first Ceph tutorial, we used the 'cluster' directory. Install Ceph on the client node with ceph-deploy and then push the configuration and the admin key to the client node. The Ceph installation will take some time (depends on the server and network speed). When the task finished, connect to the client node and change the permission of the admin key. Ceph has been installed on the client node. Ceph allows users to use the Ceph cluster as a thin-provisioned block device. We can mount the Ceph storage like a normal hard drive on our system. Ceph Block Storage or Ceph RADOS Block Storage (RBD) stores block device images as an object, it automatically stripes and replicates our data across the Ceph cluster. Ceph RBD has been integrated with KVM, so we can also use it as block storage on various virtualization platforms such as OpenStack, Apache CLoudstack, Proxmox VE etc. 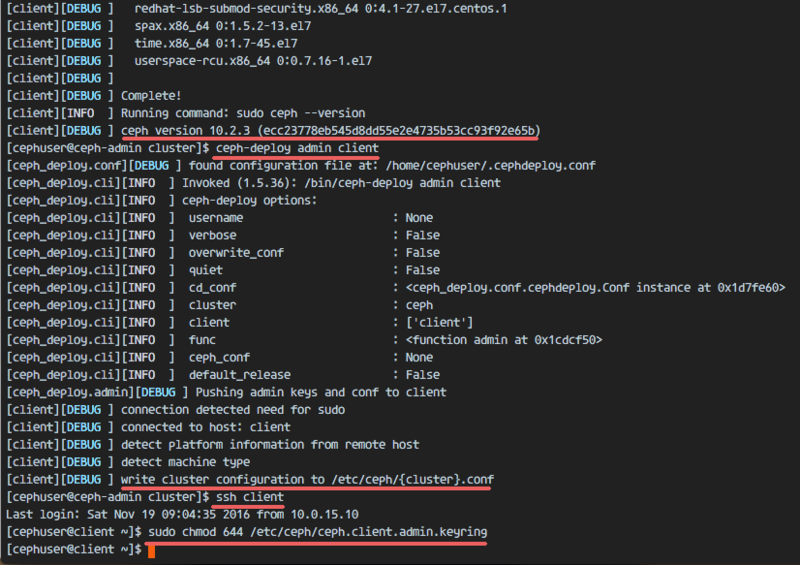 Before creating a new block device on the client node, we must check the cluster status. Login to the Ceph monitor node and check the cluster state. 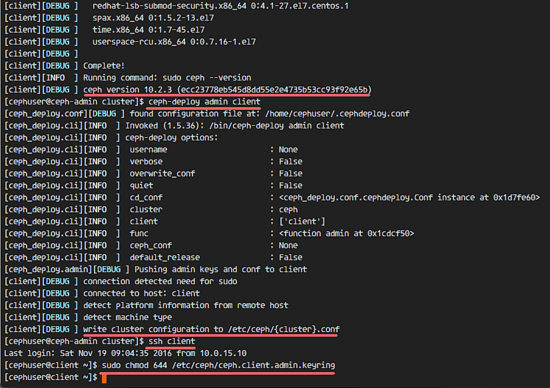 Make sure cluster health is 'HEALTH_OK' and pgmap is 'active & clean'. In this step, we will use Ceph as a block device or block storage on a client server with CentOS 7 as the client node operating system. 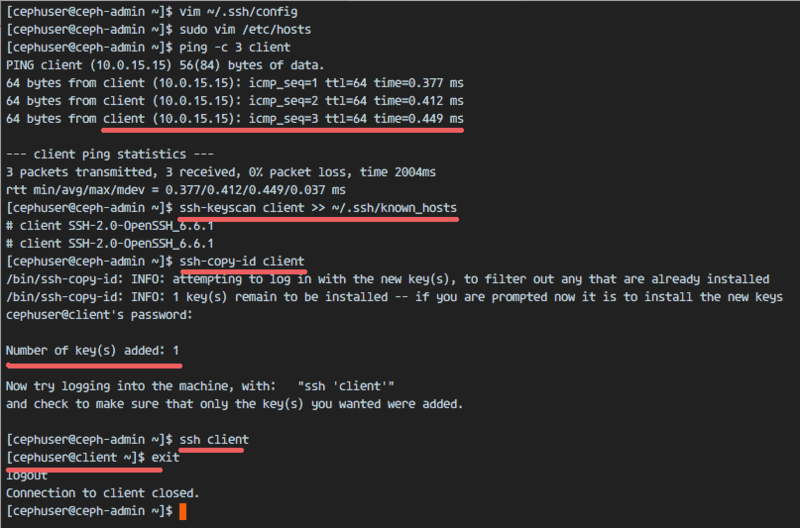 From the ceph-admin node, connect to the client node with ssh. There is no password required as we configured passwordless logins for that node in the furst chapters. Ceph provides the rbd command for managing rados block device images. We can create a new image, resize, create a snapshot, and export our block devices with the rbd command. Create a new rbd image with size 40GB, and then check 'disk01' is available on the rbd list. Next, activate the rbd kernel module. Now, map the disk01 image to a block device via rbd kernel module, and make sure the disk01 in the list of mapped devices then. We can see that the disk01 image has been mapped as '/dev/rbd0' device. Before using it to store data, we have to format that disk01 image with the mkfs command. I will use the XFS file system. Mount '/dev/rbd0' to the mnt directory. I will use the 'mydisk' subdirectory for this purpose. The Ceph RBD or RADOS Block Device has been configured and mounted on the system. Check that the device has been mounted correctly with the df command. Using Ceph as Block Device on CentOS 7 has been successful. Using Ceph as a Block Device on the CentOS 7 Client node has been successful. Now we will configure to automount the Ceph Block Device to the system. at boot time We need to create a services file for 'RBD Auto Mount'. Create a new file in the /usr/local/bin directory for mounting and unmounting of the RBD disk01. Save the file and exit vim, then make it executable with chmod. Next, go to the systemd directory and create the service file. Reload the systemd files and enable the rbd-mount service to start at boot time. If you reboot the client node now, rbd 'disk01' will automatically be mounted to the '/mnt/mydisk' directory. Thank you for your article, everything works OK. But what should I do next to map this /dev/rbd0 40 Gb to Windows Server 2012? I want to see this 40 Gb partition as a logical disk D: or E:? Does anyone have a example of the kernel paramaters required to modprobe a ram0 disk diretly from the rbd.ko modules not the binary. I know this can be done I just lost my reff or forget how.